Dog training for a great recall: Following the sell-out success of June’s Dogfather Recall Workshop support of Moulton College Animal Therapy Centre, Northampton, we’re holding another limited availability low cost Dog Recall Training Workshop on Weds 12th September 7-9pm. Come along and learn how to get your dog to come back every time – even when there’s a distraction. Click on the poster for more info. 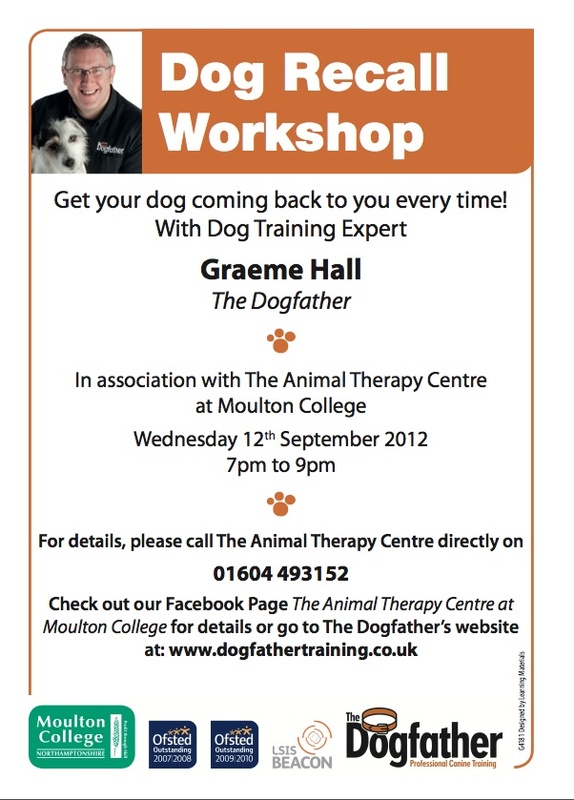 The ticket price is just £21 – That’s a fraction of the cost of a Dogfather One to One consultation and two lucky dog owners will be chosen in advance to bring along their dog to be trained by Graeme Hall “The Dogfather” on the night. There are two key questions that you should always be able to answer if you want your dog to come back every time. Come along and find out what they are and learn how to train the perfect recall.